Reston Hospital Center is home to the Mid-Atlantic’s most comprehensive robotic surgery program. We continuously collaborate on emerging technologies and techniques to deliver an enhanced surgical experience reducing hospital stays and increasing recovery times. 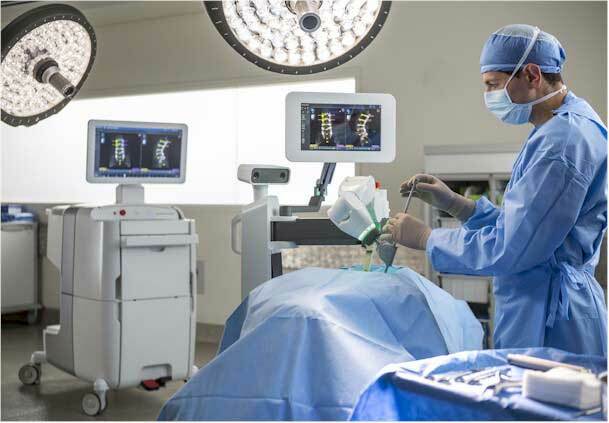 Reston Hospital Center was first in Northern Virginia to use the da Vinci® Xi robot, widely considered to be the most effective and least invasive surgical technology; and we are the only hospital in the state to offer Mazor X™, a robotics assisted surgical guidance for spine surgery. Using the Mako Robotic Technology, our orthopedics team performed the first total knee replacement in Virginia. Our Total Joint Center now offers eligible patients robotic assisted surgery options for partial and total knee replacements as well as total hip replacements. Our patients enjoy a customized, personalized, patient-centered experience – a hallmark of our hospital, leading to exceptional outcomes.